There are lots of aspects that go into making a great function venue. There is the setting, the food, the drinks, the service, the convenience and the fun. Another important, but often neglected, factor is inclusivity. Many function venues restrict the demographic allowed through their doors by way of their rules or the environment they have created. Harbour Kitchen, on the other hand, prides ourselves on our inclusivity. We welcome people of all ages and backgrounds to our waterfront venue and offer something for everyone. Many people assume that underage guests aren’t allowed at event venues that have bars. This isn’t the case. Minors are welcome to enjoy all that Harbour Kitchens offers (aside from our alcoholic beverages) provided they are accompanied by a guardian. This holds true for the duration of any event and we encourage this inclusivity. This means you can invite your nieces or nephews to your birthday celebration or wedding reception, and your friends with young children needn’t miss out either. There is plenty to keep our younger guests happy at Harbour Kitchen. The boats and harbour activity is a constant source of entertainment, our food is delicious for people of all ages and we have plenty of soft beverage options. We also welcome all those at the other end of the age spectrum. At Melbourne’s premier function venue we’ve hosted plenty of 70th, 80th and 90th birthday celebrations and… let us assure you… age is no barrier to fun! We have see the bar and dance floor remain equally busy long into the night at events that might surprise you. 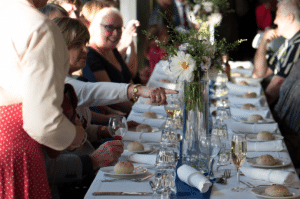 Whether you are organising a christening, a family friendly event or a 100th birthday, Harbour Kitchen has all ages covered and you can rest assured that every guest will have as good a time as one another.